A friend of mine gave me a jar of homemade blueberry pie moonshine this Christmas, I absolutely loved it! It’s been a while since I’ve had it now and can still remember how delicious it was. 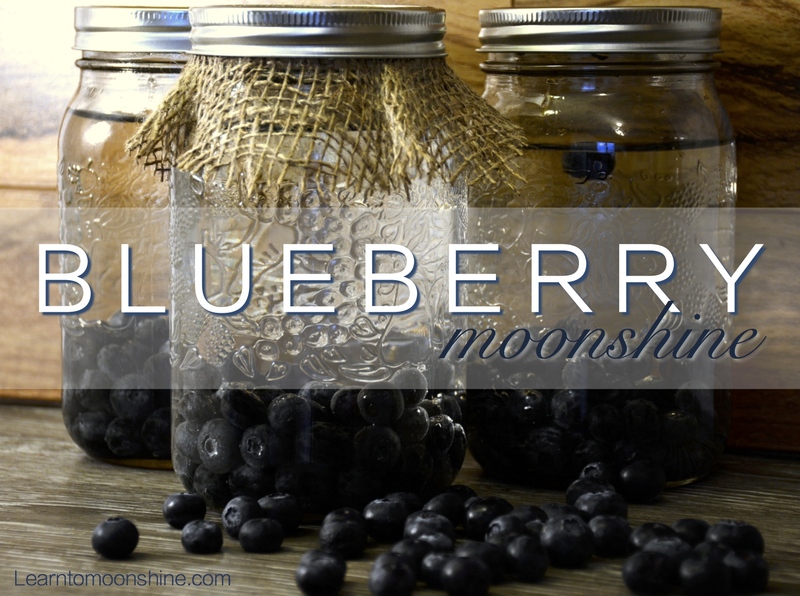 This week I decided to make up a batch of Blueberry Pie Moonshine and share the recipe with you. Hope you like it! I’ve posted the recipe below you might want to consider making a double batch so you can give some away to family and friends. This recipe will make just over a Gallon of blueberry pie moonshine, you can adjust the strength by adding more or less moonshine. If you don’t have access to moonshine you can substitute it with everclear or maybe you should just make your own still ! Add blueberries, brown sugar, white sugar, blueberry juice and vanilla into a large pot and bring to a boil. Then reduce heat and simmer for 30 min. Remove from heat and let cool, once base is cooled add desired volume of Moonshine to base ( This will depend on how strong you want your blueberry pie moonshine to be so I’ll leave it up to you). Once you’ve added the moonshine ( or Everclear) bottle in 1L Mason jars. I like to let the blueberry moonshine age at least a week before drinking. This allows the flavors to blend nicely. But you can drink it as soon as you jar it if your in a hurry. I’ve seen recipes where people add cinnamon to the base. I’ve never tried this but it sounds like it could be a good addition. Leave a comment below and let us know how you liked this recipe we love hearing from our readers. If your looking for more Moonshine recipes check out How to make Apple Pie Moonshine or our Homemade Bailey’s Recipe. 39 Responses to "Homemade Blueberry Pie Moonshine Recipe"
Have you tried it with everclear? Does it burn too much to enjoy or does it smooth out for goooood sipping? Thanks, Earl. Just cooked some up and will let it age a week or so with the Everclear, and see if I need the glycerine. Using the fresh juice, it’s probably best to keep it refrigerated, right? Do you use vegetable glycerin? How much? Few drops? I didn’t in this recipe but you can add vegetable glycerin. start with 5-10 ml per L give it a good shake and test. You can always add more but you can’t take it out ! I make apple pie moonshine with mostly everclear and some vanilla vodka. It’s incredibly smooth. Hi Leslie I’d love to try your recipe. Post it and I’ll give it a go ! my husband loves this recipe, it makes a lot AND smells just like apple pie, you CAN’T smell the alcohol. Let my batch sit for a week, blended pretty good, but still has that strong everclear bite. Adding glycerin, should I let it sit a week or two to blend or is the glycerin a fix and drink right away kind of thing? You’ll notice the effect of the glycerin after you add it. I usually place a fine screen over the top of my jug and leave it for a few weeks then add the glycerin to taste. Let me know how it turns out. What’s the proof of your shine ? I’m using 180 proof Everclear. Does this receipt need to be refrigerated? Nope you should be good the high alcohol content will preserve your Blueberry pie Moonshine. I do like to always keep one bottle in the fridge so it’s ready to serve! I have added cinnamon =, but like real blueberry pie and muffins, use it sparingly. This spice in blueberries is only intended to be a hint in the background that enhances the blueberry flavor. Yes! I added just one 3″ stick while its simmering. Adds just the right amount of cinnamon. Tastes like blueberry pie with streusel topping! Yummy! I just made a double batch of this but I also add cinnamon sticks and after it cools I’m going to add whipped vanilla vodka with the moonshine at the end I’m also going to let this sit for a few months. Has anyone left it out in their pantry and not refrigerated it…how long will it stay good or will it mold with the fruit in it? Thx! how many mason jars and what size do you need for this recipe? The recipe will make just under 1.75 Gallons or 6.5 Litres of Blueberry Pie Moonshine.. Just divide that by the volume of the mason jars you’re using ! When you say blueberry juice, are you just squeezing the blueberries or can you buy blueberry juice? Walmart sells blueberry juice (from concentrate). It’s called R.W.Knudsen Just Blueberry. Comes in a quart jar. I add my fresh blueberries to this and bring to a boil with the ingredients above. You can use a strainer or cheese cloth to filter out the larger pieces of fruit if you like. I’d suggest you leave the fruit in for a week or two before filtering. Do you ever mix it with anything or only drink it straight? Ginger Ale is my choice .. Anyone else have a suggestion for Amy ? Just curious, has anyone tried with the blueberry pie filling mixed with anything clear? Can i use water instead of blueberry juice or what else can i use??? If you use water dilute it down to 35% abv and then add the fresh blueberries, you’ll get more of a Infused blueberry vodka try it without adding all the sugar first! Let me know how it turns out ! I would like to have my moonshine clear,so should I use distilled water? If I use blueberry juice won’t that make my moonshine have color? Is it okay to leave the blue beries in without having to strain them out, so that you can grt almost like a drunken berry? Like how they do with the cherries….. Ya you can leave them in!